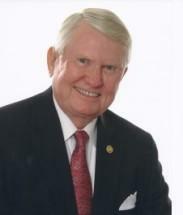 Retired Superior Court Judge Larry Stirling is a sponsor of the Davis-Stirling Act (The California Code for HOAs and Condominiums) which bears his name. Judge Stirling graduated from San Diego State University and was then commissioned into the United States Army Infantry where he went on to serve on active duty including a year as a commanding officer. His public career started with successful stints with the City of San Diego culminating in his selection as Director of Finance for the San Diego Association of Governments. He simultaneously finished law school with honors and was admitted to practice in both the California and the United States Supreme Courts. In 1977 he was elected to the San Diego City Council and then the California State Assembly and then the State Senate. Governor George Deukmejian appointed him to the bench where he served until retiring. Among the hundred pieces of legislation he successfully authored was the Davis-Stirling Act which improved the governance of common-interest subdivisions throughout California. The Davis-Stirling Act provides for mediation before litigation. Judge Stirling has settled many civil cases that would have otherwise gone to trial at substantial cost to the litigants without his help. Judge Stirling works as a mediator for the firm.